A total of nine runners will be represented over the weekend, across four meetings, which includes the return of class gallopers Alaskan Rose (pictured), Yesterday’s Songs and Loyalty Man. The team kicks off at Newcastle today with promising stayer Lord Disick (Pentire x Breeze Hil) out to keep his Metropolitan target on track when he lines up in the Group 3 XXXX Gold Newcastle Cup over 2200m. Christian Reith has been elected to ride and having drawn ideally in barrier six, with a comfortable weight of 54kg on his back, the only question mark is over the rain affected ground. “He’s much more effective on top of the ground, but we probably won’t find a better surface anywhere else, and it’s just one of those factors that you can’t control,” trainer Mike Moroney said. Second starter San Vincenzo (So You Think x Stage Beauty) has pleased Mike and the team with his progress, following an encouraging third placing on debut last month, and from the good draw he looks a horse that may take some beating. San Vincenzo lines up in the Sovereign Financial Maiden event over 1300m at Geelong with Patrick Maloney sticking with the son of So You Think. On to Saturday where Ballymore will saddle up six runners at Caulfield which will see the likes Alaskan Rose, Yesterday’s Songs and Loyalty Man all resuming for the first time this preparation. The super consistent Lord Barrington (Darci Brahma x Della Lobra) contests the first race on the card over 1200m and on recent form he is certainly among the leading chances, despite the horror barrier draw of 19. One of the most promising young three-year-olds in the stable, Barthelona (Zoffany x Barcelona Girl), will also have to contest a bad barrier draw in the three-year-old event over 1100m in order to maintain his unbeaten record from two starts to date. 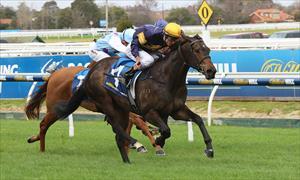 “There’s plenty to like about this colt and he’s trained on well from his last win. He meets a stronger field this time, but he has to face this quality of field sooner or later – I think he’s one of our big spring horses,” Moroney said. Another three-year-old that has really caught the eye in her only two race day appearances is Sognani (Magic Albert x Inaname) who takes her place in the fillies event over 1400m. Carrying the colours of inform owner Lib Petagna, Sognani will jump from an ideal barrier (2) and looks to be a competitive chance in what has shaped up to be a very strong field. Race four sees the return of quality galloper Alaskan Rose (Encosta de Lago x Saskia) who resumes in the Rating 90 event over 1400m and Moroney is more than happy with the daughter of Encosta de Lago has heading into tomorrow’s race. Stakes winning sprinter Yesterday’s Songs (Henrythenavigator x Sarah Vee) resumes in the Listed Testa Rossa Stakes over 1200m and looks well placed to get his spring campaign off to a strong start. The likely rain affected ground should only assist the now six-year-old with three of his five career victories coming on a slow-heavy track. The last runner on the program for Ballymore is the well-regarded Loyalty Man (Fastnet Rock x Imperial Beauty) who is another that has a challenging task ahead running into a number of promising gallopers. The son of Fastnet Rock went to a new level last preparation when winning three of his last four starts and looks a super progressive horse in the making.